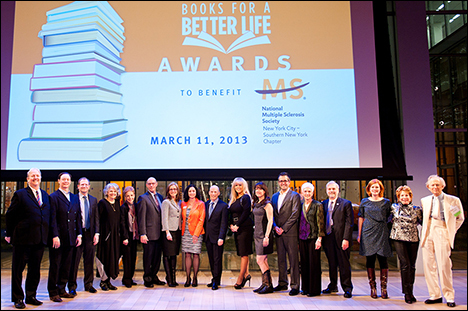 The Southern New York Chapter of the National Multiple Sclerosis Society presented the winners of the 17th Annual Books for a Better Life Awards during a ceremony at The TimesCenter in Manhattan on March 11, 2013. Hosted by television personality Meredith Vieira the evening also inducted George Slowik, Jr., president of Publishers Weekly and Gail Sheehy, speaker and best-selling author of 16 books, into its Hall of Fame. The awards honor self-improvement authors whose messages are aligned with the chapter’s mission of inspiring people to live their best lives. Since its inception in 1996 the event has raised $2 million. Tom Wolfe presented the award to Gail Sheehy. "I am extremely honored to have been inducted into the Books for a Better Life Hall of Fame," expressed Ms. Sheehy, author of the revolutionary book Passages. "To be named in the same company as previous inductees such as Deepak Chopra, Jamie Raab and many others makes me even more proud to be associated with Books for a Better Life and the important fundraising support it provides for the New York City - Southern New York Chapter of the National MS Society." "It’s my honor to be inducted into the National MS Society’s Books for a Better Life Hall of Fame,” said Slowik. "The work the Society does on behalf of its members is invaluable in the fight for bettering the lives of those living with MS. I and my colleagues at Publishers Weekly know that books can save lives and certainly make a real difference in the lives of those who struggle with MS every day."